The laws of the Old Covenant still stand for Israel , to condemn them for refusing the new covenant. So whether you are Jew or Gentile, if you refuse the New Covenant, you will be condemned. Later God makes a separate covenant is made with Abraham while he is still under the Noahide covenant. The Abrahamic covenant declares that because of Abraham's faith, God promises him a son in whom all nations will be blessed. This occurs before the covenant of circumcision in the flesh and 430 years before the covenant of law with is children of through Jacob ( the children of Israel). New International VersionSo God said to Noah, "This is the sign of the covenant I have established between me and all life on the earth. "New Living TranslationThen God said to Noah, "Yes, this rainbow is the sign of the covenant I am confirming with all the creatures on earth. "English Standard VersionGod said to Noah, “This is the sign of the covenant that I have established between me and all flesh that is on the earth.”New American Standard Bible And God said to Noah, "This is the sign of the covenant which I have established between Me and all flesh that is on the earth. 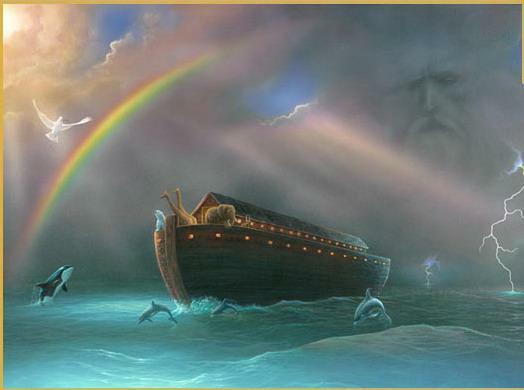 "King James BibleAnd God said unto Noah, This is the token of the covenant, which I have established between me and all flesh that is upon the earth.Holman Christian Standard BibleGod said to Noah, "This is the sign of the covenant that I have confirmed between Me and every creature on earth." International Standard VersionGod also told Noah, "This is the symbol of the covenant that I've established between me and everything that lives on the earth. "NET BibleSo God said to Noah, "This is the guarantee of the covenant that I am confirming between me and all living things that are on the earth." GOD'S WORD® TranslationSo God said to Noah, "This is the sign of the promise I am making to all life on earth. "Jubilee Bible 2000And God said unto Noah, This shall be the sign of the covenant, which I have established between me and all flesh that is upon the earth.King James 2000 BibleAnd God said unto Noah, This is the token of the covenant, which I have established between me and all flesh that is upon the earth.American King James VersionAnd God said to Noah, This is the token of the covenant, which I have established between me and all flesh that is on the earth.American Standard VersionAnd God said unto Noah, This is the token of the covenant which I have established between me and all flesh that is upon the earth.Douay-Rheims BibleAnd God said to Noe: This shall be the sign of the covenant which I have established between me and all flesh upon the earth. Sinai. The world is still under the covenant with Noah, Israel is under its special covenant with God of which the Sabbath is the "sign" of the Old Covenant. 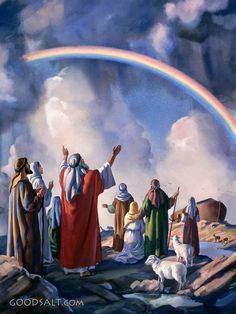 The Covenant of the Rainbow…16"When the bow is in the cloud, then I will look upon it, to remember the everlasting covenant between God and every living creature of all flesh that is on the earth." 17And God said to Noah, "This is the sign of the covenant which I have established between Me and all flesh that is on the earth.". There is no covenant of the law of Moses in existence at the time of Abraham. The New Covenant will save all peoples on the basis of faith apart from the covenant at Mt. The laws of Noahide covenant still stand to condemn those who refuse the new covenant. Abraham believes God, as a gentile and his faith is "accounted as righteousness" . As Abraham and noah were saved by faith hundreds of years before the covenant at Mount Sinai. Not by the same laws but by the individual laws governing each covenant. The covenant with Noah is with all peoples.